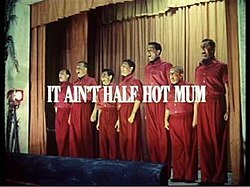 It Ain't Half Hot, Mum is a BBC television sitcom about a Royal Artillery concert party, set in Deolali in India, during the last months of the Second World War. It was written by Jimmy Perry and David Croft, who had both served in similar roles in real life in India. It was first broadcast on BBC 1 between 1974 and 1981 in eight series totalling 56 episodes in all. Each episode ran for 30 minutes.